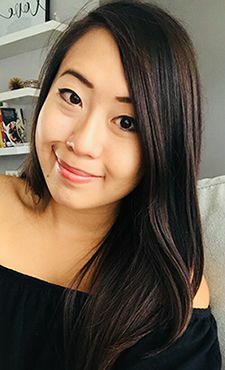 So.. three days ago was the dreaded MCAT exam day, and I felt TERRIBLE after writing the exam. And I will leave it at that. However, I have the best boyfriend in the world who decided to take me out and cheer me up after the exam, seeing as I was a wreck. We headed over to Mikado in the west end to eat some of my favourite things! At Mikado it was insanely busy, especially because it was a Friday night at 730 pm! Lucky for us, we were seated within 20 minutes because it was just the two of us. 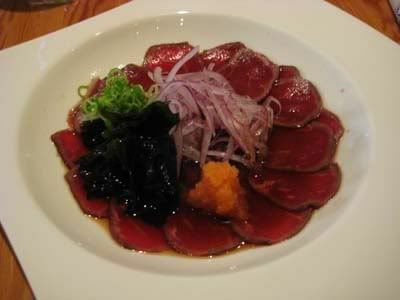 We ordered my favourites from Mikado - beef tataki & dragon eyes. Beef tataki arrived very quickly, and the presentation was beautiful. If you compare Mikado's version to the one served at Ichiban (one post down) - you can really tell which restaurant puts in more effort in terms of aesthetics! I'm always pleased with the service at Mikado, and their food tastes great! The ponzu sauce in this dish was on point - not too sour & not too salty, making the beef taste fresh & delicious! As for the dragon eyes, Mikado is the restaurant that makes it the BEST. Out of all the places that I've tried that attempts to make this dish, Mikado wins the award hands down. Andrew & I previously speculated, thinking maybe Mikado is the place that started up dragon eyes in Edmonton. I know there's such a thing as a dragon roll, but I haven't really seen dragon eyes anywhere but in Edmonton. This is just what we think since we like Mikado the best! If anyone knows anything about this, let me know! Anyways, the dragon eyes are my favourite dish, since the fish is fully cooked! The fish is still nice and tender, but I think my favourite part of this dish is the rice! The rice is very warm and soft, being the perfect contrast to the crisp outer layer. 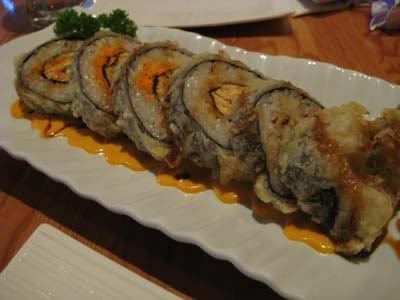 With the delicious sauce on top, this is my ideal sushi roll! After our light 'dinner', we headed over to The Melting Pot for some dessert. I can never pass up dessert, even after a very filling meal! There's always that little extra space my stomach can make for a sweet treat :) I was actually pretty surprised that night, because it was our first visit to this fondue restaurant. From the outside, it seems to be a pretty small space, somewhat like a small, cozy restaurant. But, when the hostess led us to our table, we were taken along dimly lit hallways, passing by multiple tables and even party rooms before arriving at our small little table! The place is HUGE! But it's a very nice environment to be in on a romantic night, or just even on a date. 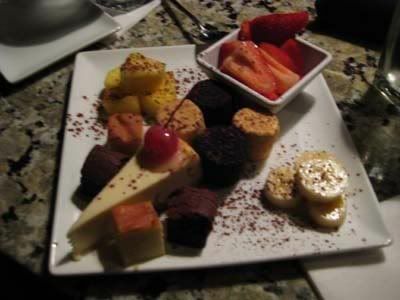 Our table was relatively secluded so we were given our privacy and time to indulge in the delicious dessert! For the dippers, we were given an assortment of: fresh strawberries, bananas, cheesecake, pineapple, oreo covered marshmallow, graham cracker covered marshmallow, pound cake, and brownies. They were great with the chocolate, but I found that the brownies and marshmallows were a little too sweet when combined with the chocolate. But my favourites would have to be the cheesecake and poundcake dipped in the chocolate! 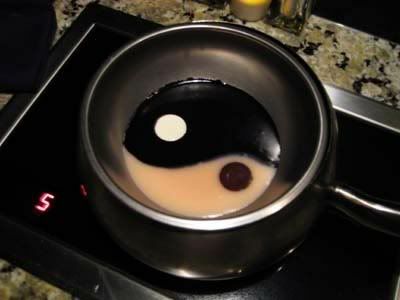 Our Yin & Yang fondue was very delicious! But it seemed that the passion fruit white chocolate portion was much smaller than the side with dark chocolate. It was a great combination of the two chocolates together, with the different chocolates making the sides taste different! Once we were finished, it was a little difficult to navigate through the dark maze of the restaurant, but we made it out, with our tummies satisfied! I definitely want to come back to the Melting Pot in the near future to try out their full four course meal, especially the cheese and broth based fondue. They're currently featuring a new menu, entitled "Big Night out France" so definitely head over and check it out! Yayayayayayayayayayayayayayayayayayayayayayayayayayayayayayayayayayayayayayayayayayayayayayayayayayayayayayayayayayayayayayayayayayayayayayayayayayayayayayayayayayayayayayayayayayayayayayayayayayayayayayayayayayayayayayaya me like dragon eyes. Great write up Andrea! I have never been to the melting pot but heard great things about it, my friend and said their cheese fondue recipe is amazing!